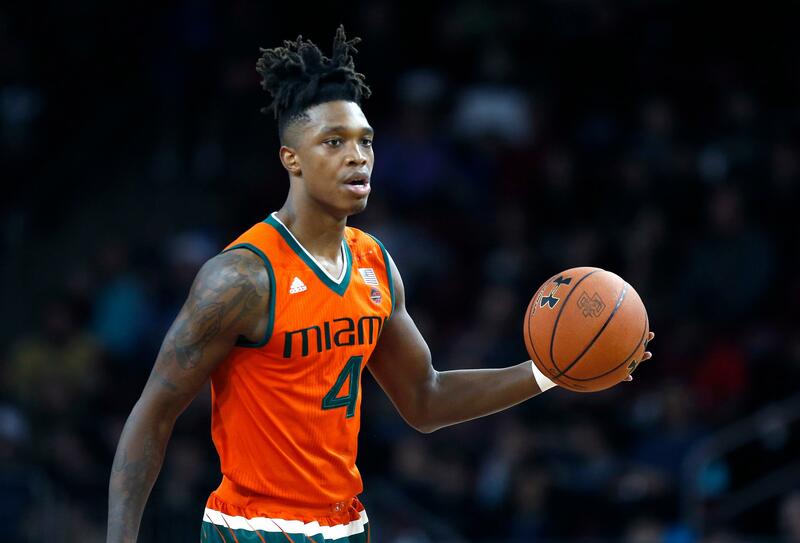 Wed., April 4, 2018, 5:36 p.m.
MIAMI – Miami Hurricanes freshman guard Lonnie Walker IV says he’ll turn pro this year, a move anticipated even before his college career began. Walker announced Wednesday on Twitter that he’ll hire an agent, which will prevent him from returning to the Hurricanes, and plans to enter the NBA draft. Many projections list him as a lottery pick. The 6-foot-4 Walker’s departure is no surprise. A year ago, Miami coach Jim Larranaga said Walker would likely be a one-and-done. Walker became the first freshman to lead the Hurricanes in scoring since 2001. He averaged 11.5 points while shooting 42 percent, and averaged 13.6 points in Atlantic Coast Conference games. Walker was perhaps the most highly regarded prospect in school history when Larranaga signed him out of Reading, Pennsylvania, in late 2016. He’s believed to be the first Hurricanes player to turn pro after his freshman season. Miami sophomores Bruce Brown Jr. and Dewan Huell have said they’ll declare for the draft but won’t retain an agent, leaving them the option of continuing their college careers. Published: April 4, 2018, 5:36 p.m.